WinSCP Free Download latest version 5.9 for Windows 32/64 bit. 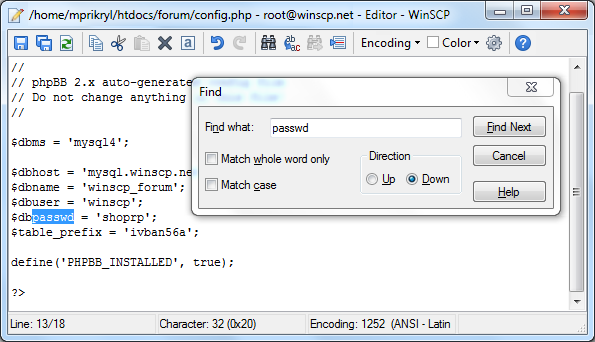 Get WinSCP offline setup, standalone installer. Windows Secure Copy is a freeware file transfer protocol working only on Windows. This software is used to transfer files between two computers, but it also has some basic file editing tools. The User Interface has a nice design and it’s rich with tools and settings. The main window is splitted in two panels, one for your local computer and one for the remote computer which you connect to. You can also use a secondary interface which is more similar to Windows Explorer and you can only see the connected computer. You can also download CuteFTP and benefit from 30 days trial. The difference between them is the panel numbers and the fact that the first interface is based more on keyboard control and the second one is based more on drag and drop type of activity. It features a basic text editor used to edit local files or remote files. After you finish editing a remote file and you save it, the application will upload it automatically. All connection details can be saved to be used later without having to enter them again. It’s advised to run this ftp client on a computer protected with a quality security suite like Kaspersky Internet Security 2016 and Bitdefender Internet Security 2016. They will prevent passwords being stolen or the transfer of viruses from one computer to another. The possibility of using the SSH protocol is also available. The authentication method is highly secured and offers strong defense against network packet sniffing and against any keylogger. The portable version uses configuration files instead of registry. Support for many languages: the default language installed is the one which your Windows OS uses. Support for FTP, WebDAV, SFTP and SCP protocols: the last two using SSH connection. Saved credentials can be protected by using a master password. Availability of a portable version which can be downloaded from this page also. Commander Interface: two panels designed for those who use keyboard the most. Explorer Interface: one panel for the remote computer and a dropdown list tree for the local computer. OS: Windows XP SP2 and SP3, Vista, 7, 8, 8.1, 10, Windows Server 2003 SP1 or newer. Click the link below to start the WinSCP Free Download Latest Version 5.9. If you have any problems while downloading please leave a comment below. After the page opens remember to choose the “Download through your browser” option to start downloading WinSCP Offline Installer, Standalone Setup.